Is this the Sookholme development, or yet another one? mikeC wrote: Is this the Sookholme development, or yet another one? Oh dear! We must be the solar capital of the UK. You really do have to wonder where all the power is going, that these solar farms are supposed to be generating, though the past few weeks have been so dull I doubt they're generating a lot. Well, that just about says it all. Warsop is the back water of Mansfield. Is anyone campaigning against this new development? Maybe not if it's a back door planning application, so we need to know more about it. A very warm welcome to the forum! There are a lot of people who lurk in the background and it's always good to welcome new input. 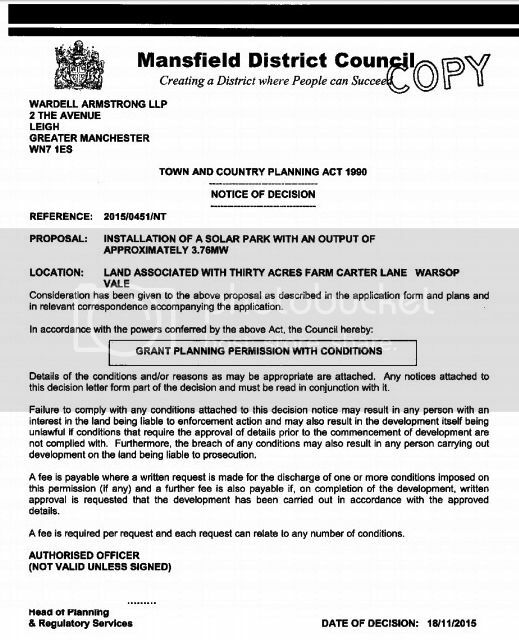 That link identifies the scheme at Thirty Acres Farm... and following that identification the planning application was with Mansfield District Council, their reference 2015/0451/NT, Case Officer Peter Mansbridge. The site is in Warsop Carrs Ward, the application was passed on 18th November 2015 (Planning Committee Item 6).